Coil compression springs or tension springs installed into a clutch mechanism to accomplish the action of engaging and disengaging when required to. At Acxess Spring we’re able to manufacture custom coil clutch springs for those who wish to improve the performance of their clutch mechanism.The diagrams and examples provided below will show you how you can “edit” your stock coil clutch spring design to have more force thus reducing clutch slip or fast clutch wear. To begin the improvement of your clutch spring design, you must first know the physical dimensions of the stock piece. The physical dimensions consist of both the spring’s dimensions and the clutch pieces surrounding the spring. Knowing the dimensions surrounding your clutch spring will help to make sure it will fit when installed and you will not have any issues when the spring is in motion. In case your clutch spring is an extension spring, all of these measurements have to be taken into note as well. Coil clutch springs are compression springs which may be used in different types of clutches. Some are used in clutch dampers to control vibrations and sound. The compression springs are compressed by the radial vibrations of a drifting engine. They will be compressed to solid height when the main damper springs take over. 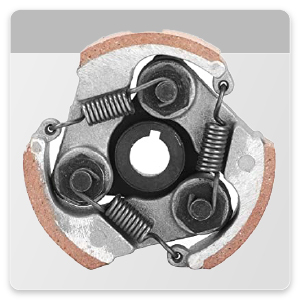 Coil clutch springs are also used for vehicular clutches. They are installed in between the diaphragm springs and make the clutch engage and release in the course of changing gears. To adjust the force of a coil clutch spring spring there are several options. For more force, you may increase the wire diameter, decrease the outer diameter, take some coils out, or add more free length to generate more force through more travel. On the other hand, for less force, you may decrease the wire diameter, increase the outer diameter, add coils, or shorten the free length although shortening the free length is not recommended in these cases since stock coil clutch springs should already be at a length where it is pre-loaded at a minimal distance traveled. Tension clutch springs are extension springs with hooks coming off the spring’s ends. These are used in centrifugal clutches where the engine’s speed dictates the position of the clutch’s position. Centrifugal force is used to automatically engage the clutch when the rpm’s get too high; and to disengage when they get too low. 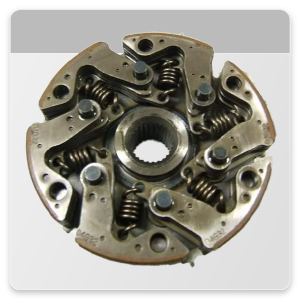 The clutch has legs which are held inwards by these tension clutch springs until the centrifugal force exceeds that of the tension springs thus making the legs reach into contact with the bell and driving the output. To adjust the force of a tension clutch spring spring there are several options. For more force, you may increase the wire diameter, decrease the outer diameter, take some coils out (shorten the body length), or decrease the hook lengths to generate more force through more travel. On the other hand, for less force, you may decrease the wire diameter, increase the outer diameter, add coils (increase the body length), or make the hook lengths longer although elongating the hook length is not recommended in these cases since stock tension clutch springs should already be at a length where it is pre-loaded at a minimal distance traveled. It is highly recommended that you use our online spring calculator, Spring Creator, when designing your tension or coil clutch springs. It is the most advanced spring design software on the net providing you with an accurate spring analysis as well as a live blueprint of the design. Additional to the calculator’s functions you will also receive suggestions of similar springs in stock, a quote on several different quantities for the springs to be manufactured custom, and the opportunity to email the spring design to either yourself or a comrade.